I was eager to see Roger Waters perform live at the Bandra Kurla Complex in Mumbai on Sunday the 18th of Feb. Tickets ranged from Rs.1000 to Rs.3000. The concert was mainly part of 'The Dark Side of the Moon' Live Tour. 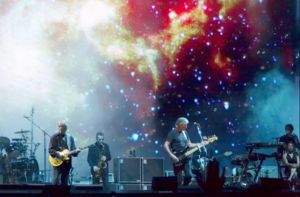 Roger Waters had been touring Australia, the Middle East and South East Asia. By the time I decided to go, the Rs. 1000 tickets were already sold out. I was disappointed and as usual while fooling around on the Internet, I came across an advertisement that mentioned something about winning tickets to the concert. I decided to try my luck and registered. I was made to answer a few questions and for the first time I took the risk of revealing my personal details like my address and telephone number on the Internet. Three days later I find a courier at my doorstep with an acknowledgment letter and a free Rs 1000 ticket. I was overjoyed and words can't describe my emotions for those couple of minutes. It was the first time I had ever been to a Pink Floyd concert and it was really wonderful. Typical Pink Floyd. The lighting and the fire works effects on the stage was awesome. The album art played on a huge screen behind Waters. The theme was supposed to be a man who was having a glass of whiskey and a puff of smoke turning on the radio and tuning to a channel where he hears Roger Waters singing. The entire concert was based on this theme. Waters sang selected songs from 'The Wall' in the first half of the concert and then performed 'The Dark Side of the Moon' in its entirety in the second half. Note: Portions of this post had been cited from www.deeshaa.org. Albert Einstein predicted the existence of something called Parallel Universes during his work on the General theory of Relativity in the 1930s. Although such a phenomenon has not yet been proved, the very thesis has made scientists scratch their heads in wonder. Einstein proposed from the fact that, since energy can neither be created nor could it be destroyed, means that there exists a balance in everything that exists in our world. For protons, there are electrons, for positive charges there are negative charges etc. This causes the entire universe to be in equilibrium and in a stable state and came to be known as the Universe's Governing Principle of Symmetry. But, as we know all that we visualize around us is made up of Matter and part of the Universe that we have seen too is made up of Matter. For the principle of symmetry to be true, there has to be a similar place or universe that is completely made up of Anti-Matter (the polar opposite of Matter). This was the propaganda put forth by Einstein. At that time Anti Matter was a new concept altogether and seemed to be a vague theory. But by the end of the 19th century, scientists have been successful in creating this 'Anti-Matter' at CERN Labs in Switzerland. Antimatter being the polar opposite of Matter, tends to be attracted by it (Matter). It reacts violently with Matter causing explosions as powerful as hydrogen bombs.When created, Anti-Matter had to be stored in particle accelerators and be suspended in vacuum (Even contact with the walls of the particle accelerators had to be prevented). This explains why Anti-Matter was never ever discovered but had to be created artificially. Since matter can neither be created nor could it be destroyed, Anti-Matter too could neither be created nor be destroyed. This proves that since Anti-Matter cannot be created out of nothingness it must be existing somewhere in another Universe altogether (Since our universe is made up of Matter, antimatter cannot exist in a stable state). This new Universe came to be known as the Parallel Universe. The existence of parallel universes could explain the lack of antimatter in our world. In Parallel Universes, there could be objects similar to the planets and stars we are familiar with in our own, but constructed of antimatter (this is one of the most recent theories, after the principles of dissymetry, and of the annihilation frontier). A possible way to reach this Universe is through a worm hole. Albert Einstein and another physicist by the name of Nathan Rosen posited that each black hole would symmetrically lie on another gravitational well called a white hole. The black hole-white hole pair would form a "Wormhole" This bridge is believed to lie in the emptiness of space (occupied by a material called Luminiferous ether) in between the two Universes. This theory however makes the universe to be visualized as a curve. All in all nothing has been confirmed as of yet and all we can currently do is to wait till any further progress is made, both, from our end as well as from people (if they exist) from the other Universe. This was a topic that I chose for my science project in school and thoroughly enjoyed working on it. When I self declared that I was born free. And truly, between us there isn’t any friction. So my life continued without any pause. Most said, I was even prettier than a Lotus flower. The very presence felt like the good luck of the wind chime. Try to remember whom we were all very fond of. Who is this Divine Manifestation? Coz those who realize its value are very few. Where would you find this person who does care? Don’t search the world for such people are very rare.